"Shy Violet never expected black magic to be real. Yes, she loves horror and the paranormal – the scarier, the better! And she’s even started her own Occult Club, though that just creeps her classmates out. 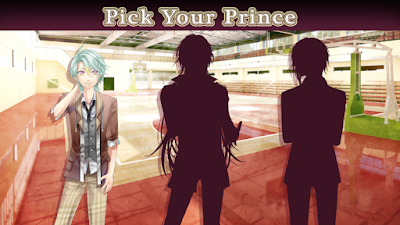 But when a popular male student is cursed for real, even Violet doesn’t know what to do. Now that Prince Not-So-Charming has transformed into a very strange ‘beast,’ it’ll take much more than a kiss to break the spell. Help Violet stop the curse, break out of her shell...and maybe even find new love (or at least new members for the Occult Club)." Hocus Pocus Prince is an upcoming visual novel where the boys are cursed into "beasts." The game will be available on both PC and mobile. Actually, I've only played the demo, because it's a commercial game, haha. I'm not sure if the game is already complete, though. I think some parts are still in development? Sorry, I'm not really sure. 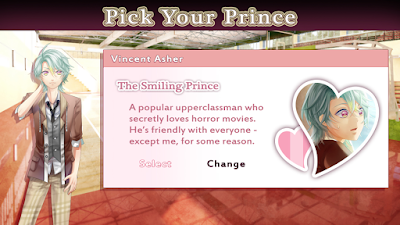 Anyway, like the summary says, in this game, you'll be playing as Violet, a really shy high school girl who's recruiting people for her club-- the Occult club-- because she's the only member. She's wondering why nobody want to join the Occult Club, but I guess that's because... it sounds pretty scary. I'm a horror lover myself, but... come on. Summoning demons in front of everyone? No way. Why couldn't they have marketed the club as, "Horror Lovers Club" or "Paranormal Club" or "Spooky Students Club?" Why, the "OCCULT Club," of all things?! Even I wouldn't join such a thing. However, Violet couldn't really take a hint, so... this year, she's still aiming to recruit people into her club. Oh boy, Violet. Before anything else, I just have to say that I really adore the writing in this game! It's very well-written, and the dialogues are absolutely fluffy and nice to read. As a writer, I wish to be able to make my readers feel the way this game made me feel. Some lines just seriously made me squeal deep inside, hahaha. 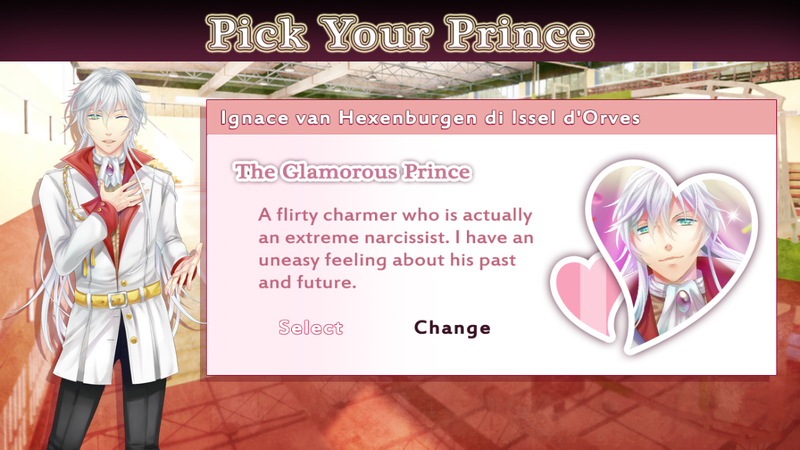 Let's go to our favorite part of an otome game, shall we? We first see Vince in the hallway, while some random girl confesses to him. I actually know someone in real life who tried to confess to a guy that she liked, but apparently, he pretty much realized where the conversation was headed, and stopped her before she could actually confess. The poor girl was in tears for most of the day. 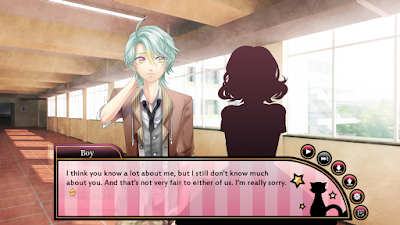 Here in the story, Vincent was as gentle as a gentleman could be while some random girl spent half an hour telling him how much she adored him, how much she stalked-- err... admired him from afar, and how she thinks they're destined for each other. Through it all, Vincent just listened patiently. And even though he did turn the girl down in the end, he did it so nicely that it didn't even feel like a rejection. Now, I don't ever wanna be rejected by a guy I like, but if I would be rejected, I hope it would be done in the Vincent way. Hahaha. However, in-game Ran isn't quite as enchanted with Vincent. Well, at first, she was, but then, in a very heartbreaking turn of events, she finds out that he actually can't stand her guts. What?! How could quiet, introverted Ran piss off Vincent that much? Stay tuned! 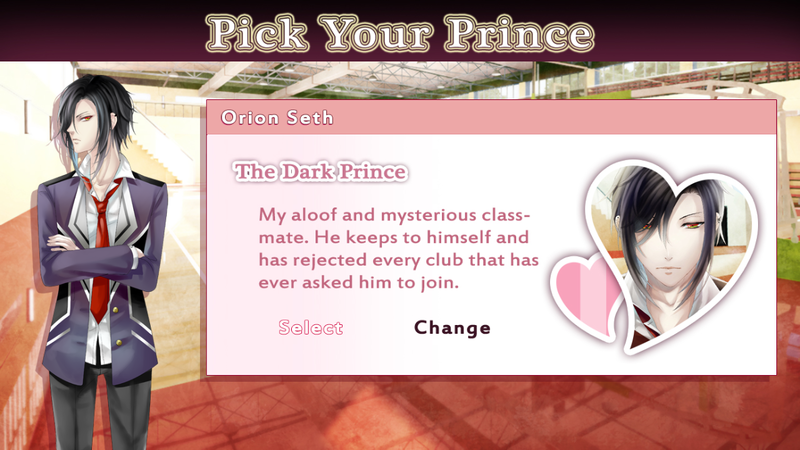 The next guy is the silent, brooding type we typically see in otome games. Orion, well, he's okay. He reminds me a lot of Baek Seung Jo from the Koreanovela Playful Kiss, who I absolutely love (and who is also played by my first and only celebrity crush-- Kim Hyun-joong; believe it or not, I don't get a lot of crushes, hahaha, not even celebrities) He's really silent, and... well, brooding, like I said. All girls seem to follow him wherever he goes, even though he rejects everyone and everything, including organization recruitments. However, he does have a sweet spot, and he can be quite a nice guy sometimes. You know, sort of tsundere-ish. Quite similar to Baek Seung Jo, really. I don't have much love for him since Vincent interests me a lot more and I tend to pick just one favorite guy whenever I play VNs, but he seems to be an okay dude to go after. BUT ANYWAY! This is actually going to be a commercial game, so I'm not sure if I'll be able to play the whole thing. (You know what sorts of problems university students face, right? Gotcha.) Still, it was a really nice demo! I had a super fun time playing this game! 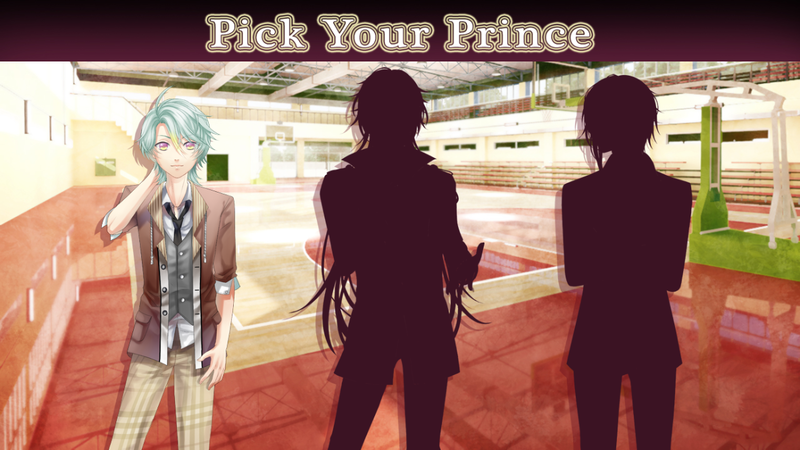 Whoever you choose for the pageant will unlock the respective guy's path. In this way, it's really up to you whose path you want to play. It's not choice-based where the guy you get depends on your decisions, instead, you can already choose right from the start who you want to get. As you can see, story-wise, I greatly enjoyed the game. The story is really well-written, the plot is pretty interesting, and the characters are nicely fleshed-out. The heartthrob Vincent really does feel like a heartthrob-- and I can definitely see why he deserves it-- and even the insufferable Ace does a good job of being insufferable! Whatever the developers were going for in characterization here, I think they definitely made it. 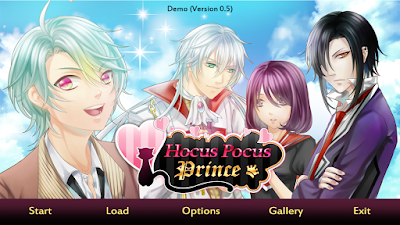 Art-wise, you can see that Hocus Pocus Prince is quite lovely. Sprites are polished, backgrounds are vivid (though they do seem familiar... I wonder if they're freeware?) and the GUI is nicely done. 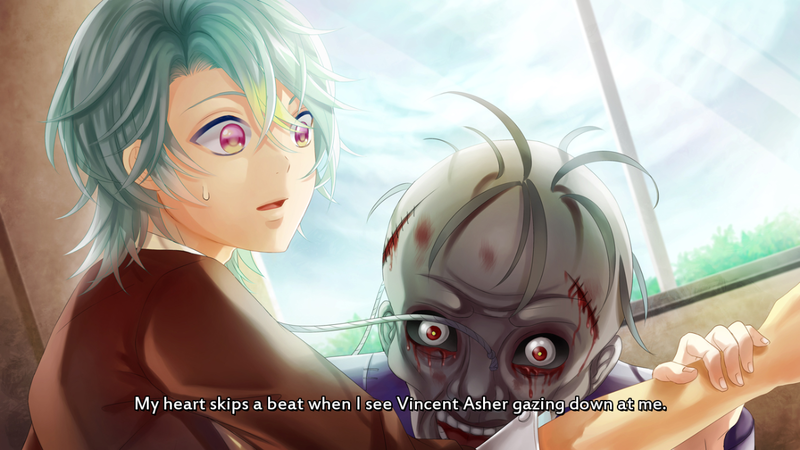 The CGs are wonderfully drawn! I just love the shading for the art. <3 So pretty. So, anyway, you can check out the game demo here! For more information and updates regarding this game, you can follow their Tumblr blog!